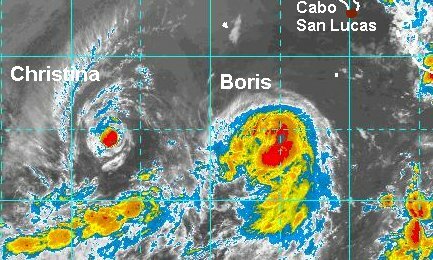 The new depression that we have been tracking has now formed about 800 miles west of Boris may become a minimal tropical storm by later this morning. Deep convection is starting to wrap around the center of circulation. This system poses no threat to land at all as it moves west. Last edited by Caribbean Traveler on Mon Jun 30, 2008 10:18 am, edited 1 time in total. Christiina was upgraded a little earlier to tropical storm strength. It is slightly better organized than it was from several hours ago. The satellite shows colder stratus clouds to the northwest which is indicative of colder water not too far away. With this being the case, it is doubtful that it will strengthen very much more. 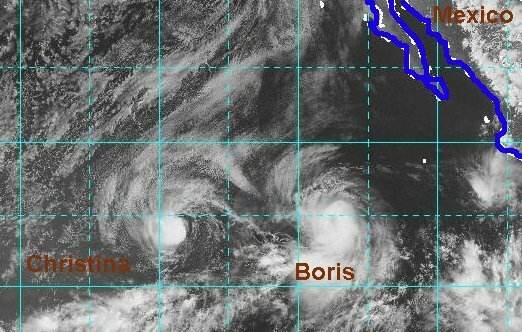 It is over 1000 miles w-sw of Cabo and is not a threat to land as it moves w-nw. Christiina is a well defined circulation, but should entrain some dry air in the near future. The dry air should wrap into the circulation and cause a decrease in intensity. Christina will not be a threat to Mexico. Christiina did entrain some dry air overnight and weakened the system. 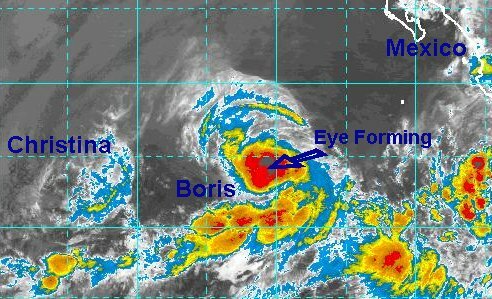 Since then, some deep convection has rebuilt over the center and it continues as a minimal tropical storm as is moves west or just south of west. Christina may hold on a little longer as a minimal storm before likely weakening into a depression. Christiina has still held on with little change today. 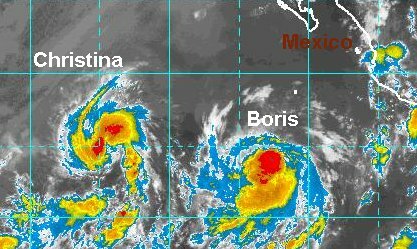 It is still a minimal tropical storm. It has moved a little south of due west which would keep it over slightly warmer water. This may allow Christina to hold on to t.s. status for awhile longer. Christiina has weakened. 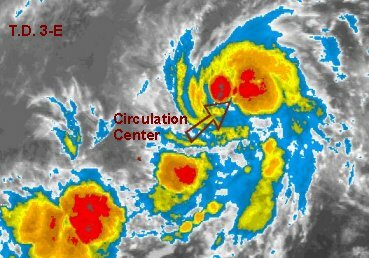 Satellite imagery shows that Christina has lost its deep convection. It should be downgraded to a depression on the next NHC advisory. NHC officially downgraded Christina to a tropical depression on its latest advisory. 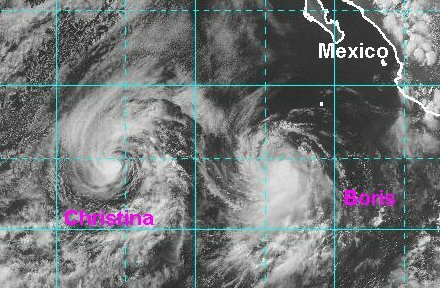 This will be the last update on Christina unless it regenerates or poses a threat to Hawaii. One last picture of Christiina. Notice that the deep convection is now gone. Only a low level swirl is left.